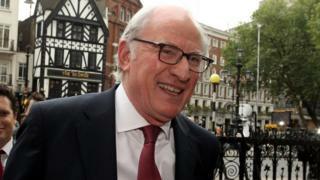 Lord Grabiner has become the second peer in recent days to resign the Labour whip in the Lords. The barrister and master of Clare College Cambridge will remain a party member but will sit as a crossbencher. He told the Times Jeremy Corbyn's proposals were "terribly damaging". It comes five days after former junior health minister Lord Warner resigned the Labour whip, saying the party did not have a "hope in hell" of winning power under its new leader. Lord Grabiner said Labour was now in "disarray" and that he could not "square [staying] with my conscience". He added: "I have nothing in common whatever with Mr Corbyn and I don't believe we are ever going to win an election." He also said he was particularly concerned about John McDonnell's appointment as shadow chancellor. "I am concerned with the economic stuff. I am really concerned with the shadow chancellor," he declared. Former Labour cabinet minister Lord Mandelson has also criticised Mr Corbyn. Speaking on the BBC's Week in Westminster programme, he said the Labour leader was not "growing into the job at all". Mr Corbyn was not showing "any professionalism in his leadership of the Labour party", and had made poor choices in his appointment of senior staff in his team, he said. A Labour spokesman said of the peer: "We welcome Tony's continued membership and support of the party. "We know he has been increasingly busy and less able to attend the Lords to participate in House business and we of course understand his decision to relinquish the Labour whip". The spokesman also said Lord Grabiner had not voted in the Lords since 2013.